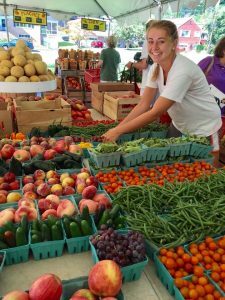 Norman’s Farm Market offers seasonal opportunities for energetic, personable and hardworking candidates interested in food and farming. Our summer stands are an institution providing jobs within the community and ideal for students saving for school or travel. Other parts of our business operate May thru November and require the help of drivers, staff, and farm workers. Norman’s Farm Market welcomes those that will help innovate, develop, and grow our business. Explore opportunities on the tabs. Norman’s Farm Crew, May thru October. Great opportunity to get your hands dirty and learn about farming. Our relatively new 60 acre vegetable farm in scenic Howard County, Maryland, is constantly exploring paths toward sustainability and innovation. Be a part of the journey to our success. Responsibilities include all aspects of vegetable production from bed preparation to harvest. Farm crew candidates should have a “good back” and healthy knees for lifting, bending, kneeling, and getting down and dirty while taking care of our plants. They should enjoy working outdoors and be capable of enduring the heat, humidity, and extreme summer weather of Baltimore/Washington region. Norman’s “A-Team” Squad, Paid Internship Position, Mid-May thru September (hours available thru October) For those that would like to experience the whole journey from farm to market and have a deeper understanding of the operation in its entirety this is the job for you. Splitting your time between the farm, the stands, and the CSA. Working closely with owner, John Norman, and developing new strategies and ideas toward accomplishing success in the sustainable farm industry of today. Assistant Farm Manager, April thru October. Assists the farm manager in all tasks from setup through cleanup. Duties and responsibilities include implementing farm plan, following nutrient management, all tractor work including: plowing, tilling, bed shaping, laying plastic mulch and drip, transplanting and seeding, spraying, mowing, and spreading compost. Other responsibilities include record keeping, setting up irrigation, staking and trellising, scouting, pest and weed management, and of course harvesting. Stand Workers, Mid-June thru Labor Day. Our stands team operates our daily retail markets. We pride ourselves on creative displays and exceptional service. Shifts typically last 6 to 8 hours, 24-40 hours per week. Duties involve opening, stocking, closing, cashiering, and providing customer service. Stand Crew Leader, Mid-May thru Labor Day (hours available thru October) Position builds upon the responsibilities of the stand worker and requires additional ability to manage, delegate, communicate and be the point of contact for customers as well as co-workers. The crew leader will work closely with management, drivers, and our farm team to assure our stands operate smoothly and maintain our standard of excellence. Duties require managing inventory, ordering, implementing promotions & sales, staff training and scheduling, administering daily checklists, as well as customer service and handling special orders. This is a full time position which requires at least 5 shifts per week, approximately 40 hours. Our CSA team keeps our weekly pickups running smoothly while providing a safe and enjoyable atmosphere for our members. Shifts typically last 3 to 4 hours, 10-20 hours per week. Duties involve opening, closing and providing excellent customer service. Our delivery drivers are responsible for distributing from our farm to our markets. This is a physical, fast-paced, and outdoor position. Delivery drivers must have excellent customer contact and driving skills. Drivers are responsible for loading and unloading their own truck, assuring no spills, and able to operate a pallet jack. Must have a valid license and a clean record. A DOT physical exam is required.